A common way to inhale essential oils is via diffusion – i.e. using an aromatherapy diffuser / vaporiser or candle burner to disperse the oil's aromatic molecules into the air. 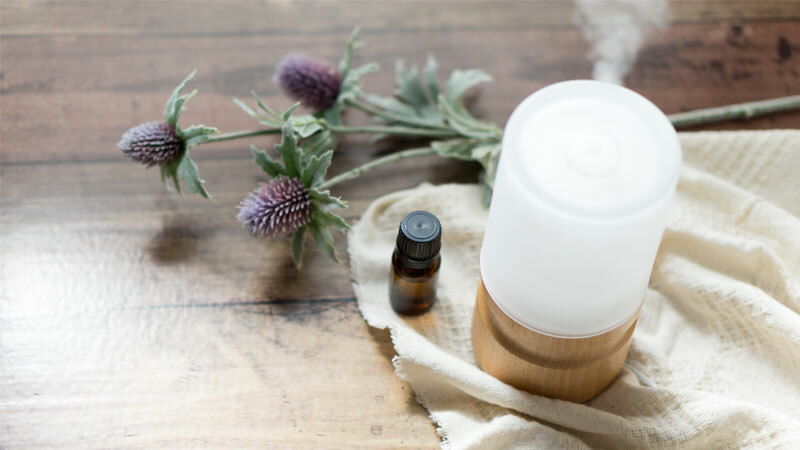 Diffusing essential oils is becoming increasingly popular as people become more aware of the health benefits of 100% natural essential oils, and the concerns surrounding synthetically scented candles and room sprays. Diffusion can be particularly helpful for relieving stress/anxiety, lifting the mood, increasing alertness, aiding relaxation and sleep, purifying the air, and reducing airborne pathogens. It is also a lovely way to naturally fragrance your home. There are a number of essential oil diffusers to chose from, and the main types are summarised briefly below. These use water and ultrasonic waves to produce a fine aromatic mist. They often come with lights and can be quite ornamental in appearance. They also act as humidifiers. Unlike the ultrasonic diffuser a nebuliser does not rely on water. The device breaks the oil down into separate molecules to produce a gas-like substance that is then dispersed into the room. It is thought that these offer greater therapeutic benefits as the smaller oil molecules are more readily absorbed into the lungs. On the downside they are more expensive and not as decorative as ultrasonic diffusers and tend to use more oil. They also don’t work as well with thicker/viscous oils. With fan diffusers such as our Aroma Stream, the oils are placed onto a disposable pad. A fan then blows air over the pad to evaporate and disperse the oils into the air. They are easy to use, do not require water, but they can be a bit noisy and you will need to purchase replacement pads. Heat diffusers such as our Aroma Stone use gentle heat to disperse the oil. You simply plug them in and pop a few drops of oil directly onto the stone. They are easy to use and clean, although you might find that some of the thicker oils leave a more stubborn residue. These are normally ceramic or metal. They have a bowl or dish to place your oils in and a tea light candle underneath which heats and disperses the oil. They are cheaper than other diffusers and do not require electricity or batteries. On the downside the strong heat from the flame can impact on the oil’s fragrance and therapeutic properties. There are also the obvious safety issues of using a naked flame near children or pets, and using in conjunction with flammable oils. Although essential oils are extremely beneficial for our physical and emotional wellbeing, they are highly concentrated, potent substances, that MUST be respected and used with care. We have provided some important safety advice below on how to diffuse essential oils safely. Certain essential oils (especially those containing aldehydes and phenols) can cause irritation to the mucous membranes. These should either be avoided or used sparingly. The following oils are considered to be mucous membrane irritants: Bay, Caraway, Cinnamon, Clove, Lemongrass, Peppermint and Thyme ct. thymol. Do not diffuse essential oils around babies, young children, pregnant women, nursing mums, the elderly, anyone suffering with a medical condition, or pets unless you are sure they are safe with no contraindications. Take care if you have allergies, asthma or similar respiratory conditions as strong aromas may trigger a reaction. Stop diffusing the oils immediately if this occurs. Use a maximum of 3 different essential oils in your diffuser to avoid overloading the body. Essential oils should not be vaporised or diffused continuously. We recommend diffusing oils for short bursts – anywhere from 5 minutes up to a maximum of 45 minutes. Research has shown that you don’t gain any extra benefits from diffusing for longer periods of time, and that our bodies respond better when exposed for shorter periods. Start diffusing for a few minutes at a time to test your reaction and increase gradually. You risk overloading your body after 45 minutes. Your body will stop responding and the therapeutic value derived will decline. Make sure the room you’re diffusing in is adequately ventilated. If the aroma becomes too strong, open a window. If you experience any adverse reactions or worsening of symptoms, discontinue and seek advice from a professional aromatherapist or your healthcare provider. Clean your diffuser regularly, following your product instructions. If you are using a candle burner, ensure that you keep the essential oils away from the flame as they are highly flammable. Keep the candle burner away from children and pets. There are a number of factors that can impact on how well diffusion works. The most of important factor is your choice of essential oils – as each oil will stay in the air for different periods of time. Top note oils will disappear much quicker (i.e. within an hour or two) and the heavier base notes can linger for hours or sometimes days. Creating a balanced blend with top, middle and base notes can therefore help the scent last longer. Room temperature and ventilation can also affect your fragrance – causing it to evaporate quicker or last longer. For e.g. a warm or draughty room may cause the oil molecules to evaporate faster. If you are diffusing essential oils for therapeutic reasons or for natural room fragrancing then it is important to ensure you are using 100% pure and natural unadulterated essential oils. You should also ensure that they have not been diluted with a carrier oil as this will clog up your diffuser. If you have any further questions on diffusing your oils or aromatherapy in general, please do not hesitate to contact us.